...a Severe Thunderstorm Warning Remains In Effect Until 215 Am Cdt For Southwestern Jackson...central Natchitoches...southeastern Bienville...sabine...western Winn Parishes In North Central Louisiana And Southeastern Sabine Counties... At 129 Am Cdt, Severe Thunderstorms Were Located Along A Line Extending From Near Jonesboro To 13 Miles Northeast Of Campti To 10 ...Read More. The National Weather Service In Brownsville Has Issued A * Severe Thunderstorm Warning For... Southeastern Hidalgo County In Deep South Texas... * Until 200 Am Cdt. * At 112 Am Cdt, A Severe Thunderstorm Was Located Near Granjero, Or 7 Miles Southwest Of Hidalgo, Moving East At 35 Mph. ...Read More. The National Weather Service In Shreveport Has Issued A * Flash Flood Warning For... Southeastern Shelby County In Eastern Texas... Central San Augustine County In Eastern Texas... Northwestern Sabine County In Eastern Texas... * Until 315 Am Cdt. ...Read More. The National Weather Service In Fort Worth Has Issued A * Flood Warning For... Eastern Henderson County In Central Texas... * Until 245 Am Cdt. * At 1139 Pm Cdt, Doppler Radar Indicated That The Heavy Rainfall Has Ended. However Due To Saturated Soils...earlier Rainfall Continues ...Read More. The Flood Warning Continues For The Red River Near Burkburnett. * From Thursday Morning To Friday Evening...or Until The Warning Is Cancelled. * At 7:30 Pm Wednesday The Stage Was 7.9 Feet. * Minor Flooding Is Forecast. ...Read More. HOUSTON COUNTY – It has been said the third time is a charm and for a company known as Texas Futura, LLC that appeared to be the case as the Houston County Commissioners Court approved a two year tax abatement for the business during a called meeting of the court held on Tuesday, Feb. 5. Texas Futura, LLC is a used oil re-refinery company which plans to build a facility in the Crockett Industrial Park. Representatives of the company, Nelson Varughese and Karthik Sundaram had appeared before the commissioners twice before the abatement was approved. Originally, the Texas Futura representatives had requested a 10-year tax abatement. When the commissioners rejected the initial proposal, the tax abatement request was retooled and a five-year abatement was requested. During a Jan. 11 meeting of the Crockett City Council, a five year tax abatement was approved which calls for a 100 percent abatement for the first two years, 80 percent for years three and four while year five is at the 60 percent mark. The county commissioners, however, only approved the first two years of abatement at 100 percent, with the stipulation if the company plans to expand, the matter could be re-visited. Prior to the abatement discussion, County Extension Agent Jo Smith introduced Tasha Brent as a candidate for the vacant Houston County Extension Agent – Family and Community Health position. “She is from Crockett and she has worked with our office for the last 4.5 years. We feel very strongly she will be an excellent candidate for this position and do our county well,” Smith said. Brent was unanimously approved to fill the position. The court approved Terrell Jones as a volunteer road hand/equipment operator for Precinct One. 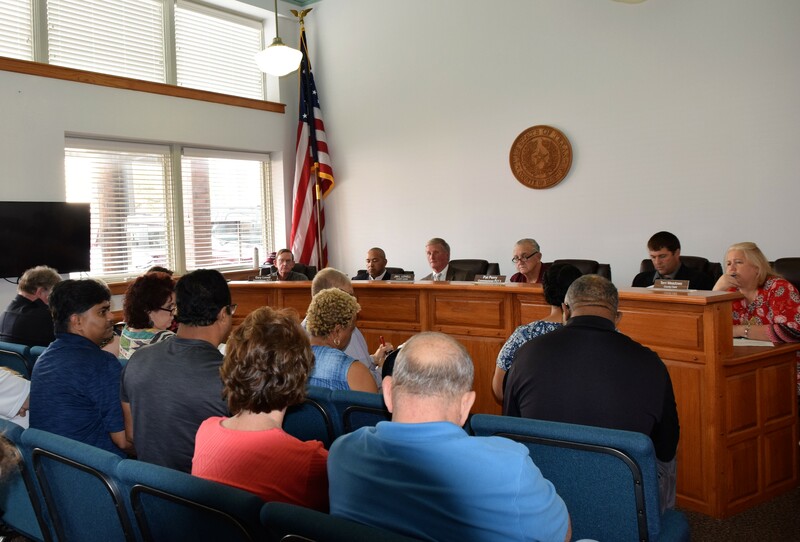 Commissioners clarified the phrase “years of continuous service” to include both full-time and part-time employment as it pertains to the retiree medical policy of the Houston County Employee Handbook. Will Johnson may be reached via e-mail at wjohnson@messenger-news.com.